A composite postcard showing various views. At the top left is the High Street, at the cross-roads looking east with the fountain in the middle. Top right is a familiar view of Saltburn Road looking west, with Admiralty Terrace on the right. Bottom left is Saltburn Road looking east. The picture was taken just east of where the swimming pool was located. 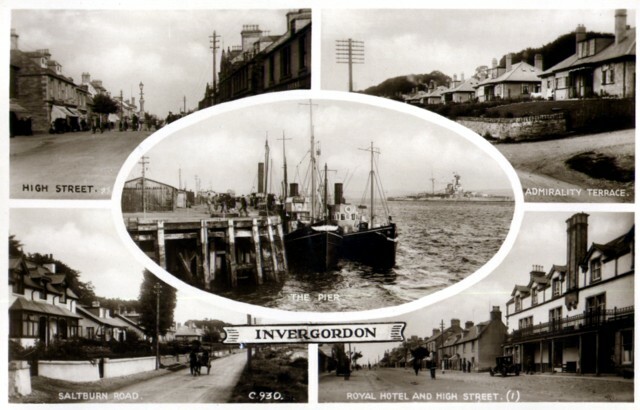 Bottom right is the High Street looking west with the Royal Hotel on the right. In the centre is 'The Pier'. A larger version of this picture can be seen in picture #524. The date of this postcard is not known but may be from the mid to late 1920s.